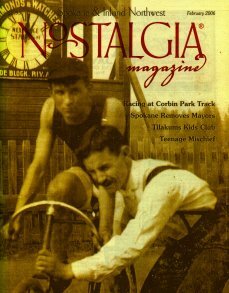 GhostTownsUSA has been featured in the February 2006 issue of Nostalgia Magazine. Click here for complete story. Featured article in the Okanogan Valley Gazette-Tribune July 8, 2004 on Lost "Ruby City" Cemetery Revisited. Click here for complete story. Boom Towns & Relic Hunters has been featured in the February 2003, District 751 Aero Mechanic, published by the world's finest union workers. Certainly a unique and specialized site, and if you are looking for research into ghost towns of the USA this is a very useful resource. Comprehensive, nicely setout and with as much information as you will most likely ever need to know about ghost towns. Check this site out - it's different and makes interesting reading. On behalf of the Shafer Museum Associates I would like to express our thanks to you for doing such a GREAT job on the new website for us. It should bring alot of favorable comment from viewers and bring us lots more visitors to the Museum. I am personally delighted and grateful to both you and Jerry for doing it for us. Boom Towns & Relic Hunters assisted King 5's Northwest Backroads TV show with their shoot in the historic ghost town of Molson on May 21st! Boom Towns & Relic Hunters has been featured in the May and June issue of Lost Treasure Magazine - the treasure hunter's magazine of choice. We are looking high and low for the best educational web sites active today. The School House presents the Too Cool School House Educational Site of the Week as carefully selected by our resident educator, Grace Smith. Check it out, and happy learning! Boom Towns & Relic Hunters of Northeastern Washington is the WWW's comprehensive and detailed Web site on the history of ghost towns of northeastern Washington state. Covering many of the ghost towns within six counties, the site offers text and historical photos of gold rush and boom towns of yesteryear. Long ago places like First Thought Mine, the Alder Mine on Alder Creek, and The Fourth of July Mine illustrate where millions of dollars in gold and silver were produced by colorful miners of a forgotten era. Information on relic hunting and metal detecting Rounds out the site. Rating: A wonderful place for learning about the old West mining era. The "Top 8 Homework Research Sites" list is compiled every week by the editors of HomeworkCentral.com. Boomtowns & Relic Hunters was selected the top site for the week of August 16, 1999!